Bouncing From Street Ball To The NBA Orlando Magic point guard Rafer Alston picked up the nickname "Skip to My Lou" in New York City's Rucker Park, thanks to his knack for skipping while dribbling the basketball. He's one of the few players to successfully make the transition from "And 1" street ball to the NBA. The Orlando Magic defeated the Cleveland Cavaliers in Game 4 of the 2009 Eastern Conference Finals playoffs. See why Alston got the nickname "Skip to My Lou"
Rafer "Skip to My Lou" Alston drives to the hoop in Game 1 of the Eastern Conference Finals against the Cleveland Cavaliers. Orlando's starting point guard picked up his street-ball nickname thanks to his knack for skipping while dribbling the basketball. The Los Angeles Lakers and Orlando Magic are back in action Thursday night for Game Four of the NBA Finals. The Magic won Tuesday and cut L.A.'s lead in the series from two games to one. 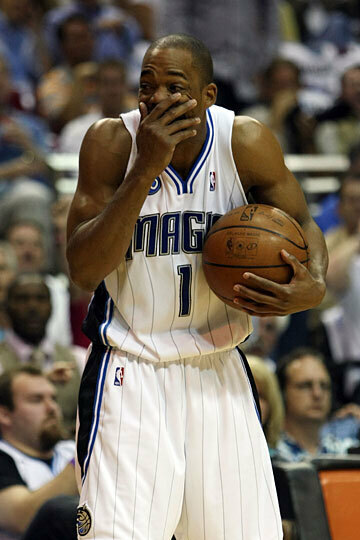 A particularly good sign for Orlando fans is that starting point guard Rafer Alston was his old self after struggling the first two games. He pushed the ball up the court, delivered pinpoint passes, hit outside shots, and he seemed to rediscover the balance between his two distinct basketball personalities — like basketball's version of Clark Kent and Superman. When he was just 11, Alston stepped onto a court at famed Rucker Park in New York City. Ron Naclerio, who would become Alston's high school coach, describes watching him play. "The crowd realized and I realized that ... [what] we just saw was not normal for a kid [who], at that point, was 11 going on 12," Naclerio says. At 14, Alston got his playground nickname while skipping past some hapless defenders. With his moves and ballhandling wizardry, he had the ball on a string, Naclerio says. "Skip to My Lou" became a playground legend by 17. The legend spread beyond New York City thanks to his starring role in the first "And 1" Mixtape, a compilation of "Skip to My Lou" video set to hip-hop music. But even as he played the role of street-balling Superman, "Skip" understood, with lots of guidance from Naclerio and other adults who cared, that his ultimate goal in basketball would require a Clark Kent approach — and so, Rafer Alston set to work. "I was always breaking down film on players, going back in the gym and the park, working on things," he says, " ... and every time they said I couldn't do this, do that, I went and worked on those things." The work showed as he zigged and zagged his way through the world of conventional hoops, from Cardozo High in Queens, where — when he wasn't, in Naclerio's words, "screwing up in school" — he averaged more than 30 points a game, to Ventura Junior College in California, where Alston was named most valuable player on the school's championship team. In 1999, Alston signed with the NBA's Milwaukee Bucks. This was a significant moment considering how many playground legends before him had crashed and burned, failing to make the most of their talent. But once in the league, Alston says, he felt like he had to put "Skip to My Lou" in cold storage. "They don't like someone going between your legs, throwing behind the back passes," he says. "But you know, I was a kid who watched Pistol Pete Maravich, and they loved him doing it. So I don't understand how they can love him doing it and it was A-OK when Pistol Pete Maravich had a lot of playground stuff in his game, but when a kid like myself comes from NYC, it's all bad." But the negativity wasn't just about Alston's fancy moves. He had a number of run-ins with the law, including charges of assault and driving while intoxicated. "If it wasn't for myself and one or two people, there'd be a good chance Rafer Alston would be either dead or in jail right now," says Naclerio. But there he was Tuesday night on ABC, helping Orlando win its first game of the NBA Finals. Naclerio says it was just as significant for Alston, after he played really well, to hear some of his Magic teammates call him "Skip to My Lou." "When he hears that 'Skip's' a little bit of accepted in the league or by his teammates, I think that's what's going to fuel him — that he can be a little bit of 'Skip' instead of, you know, in the NBA, totally Rafer Alston," he says. And this could be good news for NBA fans and bad news for the L.A. Lakers.